Welcome back, Maharanis! Valentine's Day is right around the corner and we can't stop sharing with you these beautiful weddings. 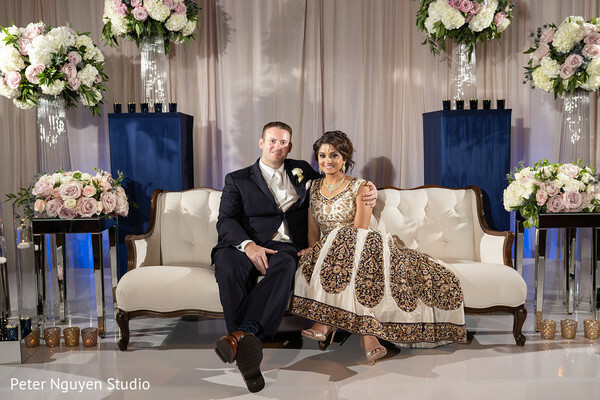 The amazing color palette of Pavitraa & Matt's ceremony and reception was truly one of a kind. They mixed various tones of light blue, grey and light purple. 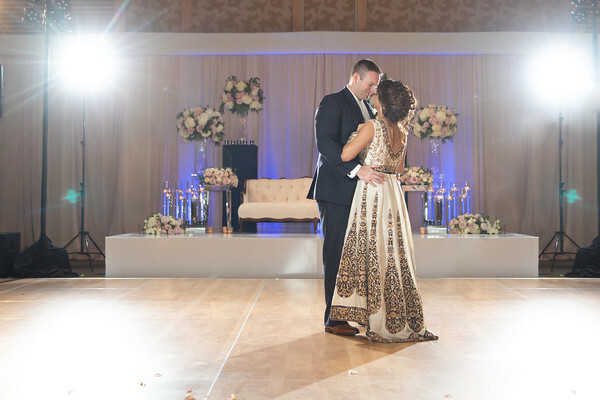 It definitely set the stage for a glittering event where our couple swore eternal love with a ton of shimmer. 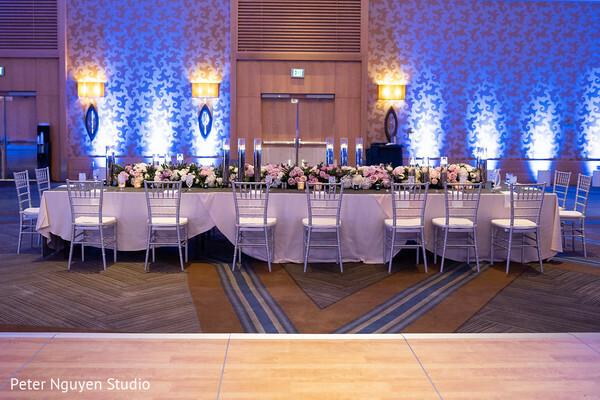 The talented crew from Kismet Events and NFP Events worked their magic and crafted the floral and decor of the entire experience. Uniquely elegant as you will see! 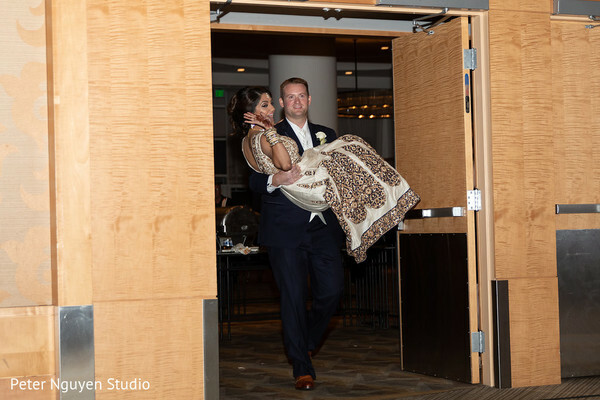 During the reception, our well-known pals from Mantra Indian Cuisine brought their A-Game and pampered the guests with the delicious treats that only a true Maharani could have approved! This whole affair is too much for our senses! 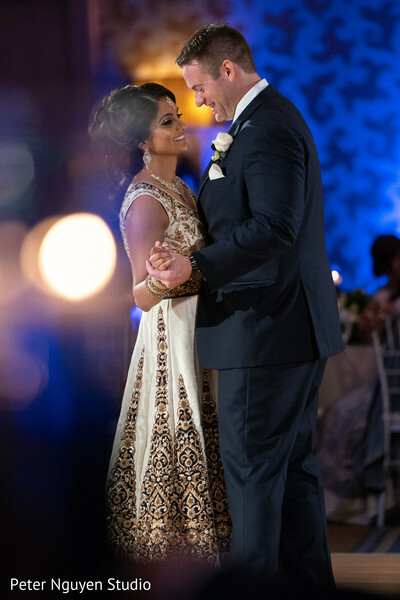 Can't get enough of this glam bride and her gown? Head on over to the gallery for more, captured by Peter Nguyen Studio. Matt and I met on Match.com. We spent a few weeks texting back and forth and decided to meet for happy hour. I think we both knew there was great chemistry as we spent 4.5 hours talking about your life, jobs, families, and everything in between. Matt was my first and the only date on Match.com so I’m fortunate that online dating brought this perfect man to me. I’ve never wanted a big over-the-top proposal. All I ever wanted is to have family around when it happened. Well, I never told Matt this but somehow he knew (I told you, he’s perfect!). We were celebrating Matt’s birthday that weekend and as a surprise to me, he called my sister and brother in law to visit us. The night before his birthday party, the four of us went out to dinner at my favorite restaurant in Scottsdale, Sassi. Once we were all seated, Matt told me that he had another surprise for me. After seeing my sister and brother in law, I, of course, said: “are mom and dad here too?” (As I looked around the restaurant). By that time Matt was on one knee and asking me to marry him. It was the perfect most unforgettable evening. Matt’s birthday party ended up turning into more of an engagement party for us but it was still a spectacular weekend! 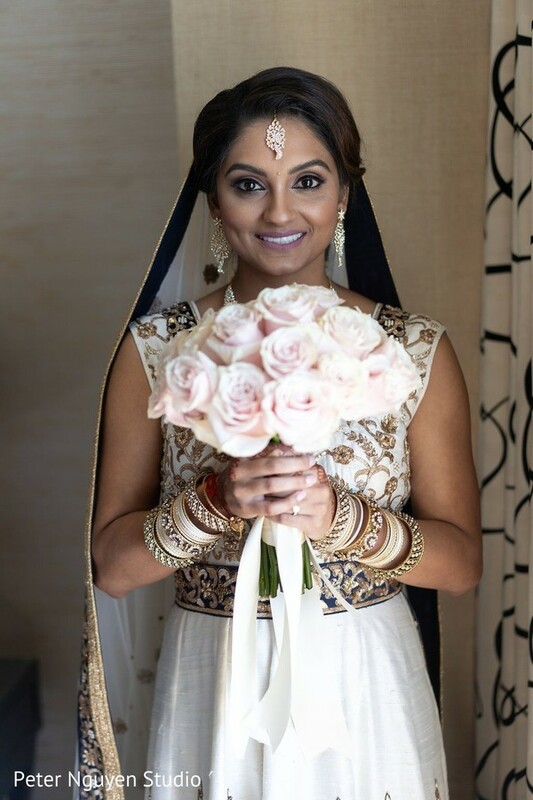 From the onset of planning the wedding, I wanted to make sure I was incorporating both cultures (Indian and western) and both religions (Hindu and Christian). Being born and raised in San Diego, I always wanted to get married by the water. Luckily, Matt loves San Diego so it was an easy choice. My dad recommended the Hilton Bayfront and it was love at first sight. The venue was perfect for the events that we wanted to incorporate and the staff was great to work with. 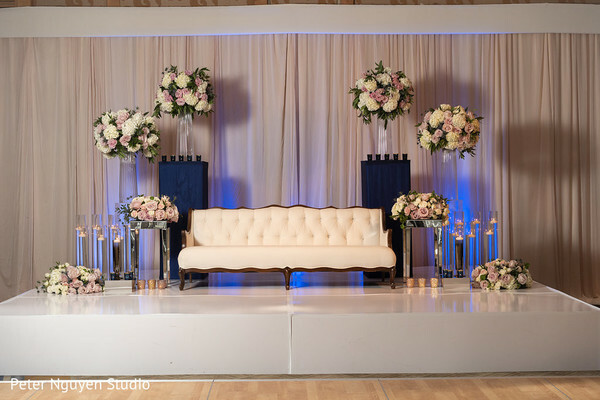 I wanted the decor to be simple but elegant - shades of blue and some pops of blush. My bridesmaids wore beautiful shalwar kameezes and the groomsmen sported dapper tuxedos. 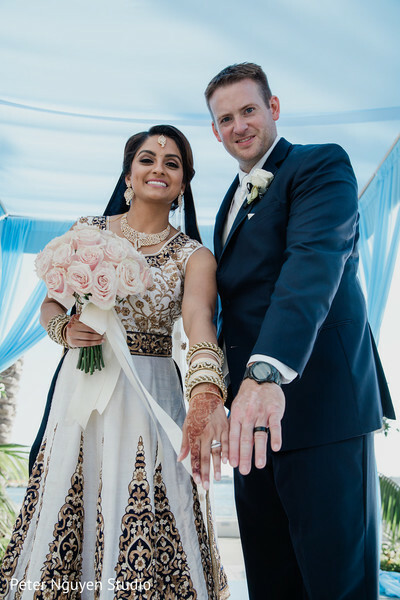 After my dad walked me down the aisle, the Hindu Pandit led us through portions of the Hindu wedding during the first part of our ceremony - which included a Ganesh puja, garland exchange, and saptapadi. We then transitioned to the Christian part of the ceremony, officiated by our friend Brett, - which included a Bible reading, vow exchange, and ring exchange. I wanted to have a fusion of the ceremonies rather than having multiple ceremonies. Being on time is something that me and my family take pretty seriously and I had an amazing wedding planner who kept us on schedule the entire day. I think by the time the reception started, we were only 20 minutes behind!! We are so grateful to my parents who gave us such a beautiful and memorable wedding day and we can’t thank them enough for it. I worked with one of my family friends to design my wedding dress. 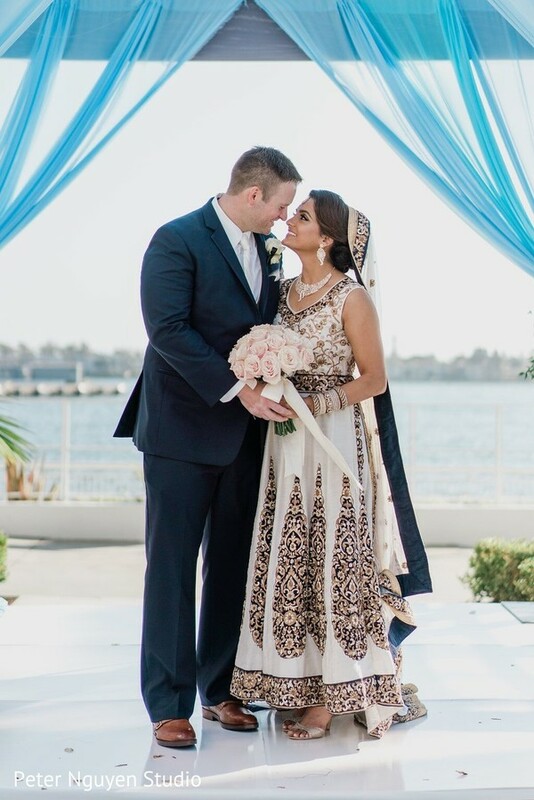 My vision to fuse both cultures came to reality as my dress was a beautiful silk ivory gown with Indian embroidery and a dupatta that mimic’d a Veil. Continuing with the blue color scheme, I chose navy blue and gold embroidery and work. I wore the same gown for the reception party but removed the dupatta so I would be more comfortable dancing the night away. The most enjoyable part of the process was seeing it all come together in the last week - it was so rewarding. Wedding planning IS stressful but it’s all worth it in the end. We had family and friends fly-in a few days early to spend time on any last minute planning and to just celebrate our big day. My favorite part was knowing that the work we had all put into this big day was all coming together! This is a hard one - there are so many special moments from that day! Prior to our wedding, one of our friends told us to “remember to take a moment, just the two of you, to soak it all in.” During the cocktail hour when our guests were finding their tables for dinner, Matt and I were sitting in another room. We had about 10 minutes to ourselves for the first time that day before we made our grand entrance as husband and wife. We talked about how grateful we were that everyone in the ballroom next door was here for us and to celebrate our love. It’s not every day you get to have all your special and loved ones in one room. 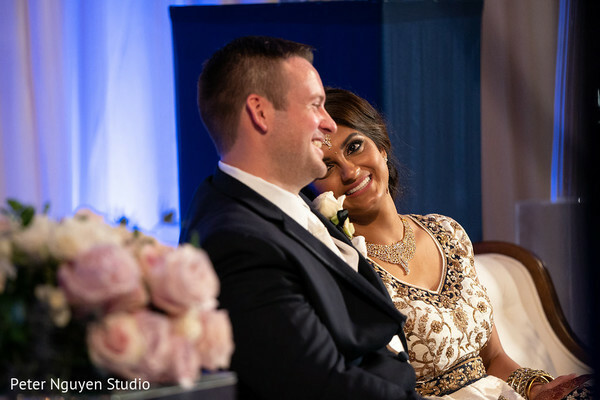 It was also an opportunity for us to soak in the fact that we had just gotten married and that it was truly one of the happiest days of our life (I get a huge smile on my face thinking about those ten special minutes). We could talk on and on about this day because it was one of the best days of our lives. We still feel like it was all a dream and the best dream, at that. We’re so thankful to our wonderful and accommodating vendors who made this day so special and customized for us. Amazing wasn't it? More to come, tomorrow. Beauty by Lishma, Peter Nguyen Studio, Kismet Event Design, Mantra Indian Cuisine and Hilton San Diego Bayfront are members of the Platinum Guide. Love what you see? Explore their portfolios.